Published on Monday, June 4, 2018. This article appears in the June/July 2018 issue of American Craft Magazine. Grain’s Waka model has a shape surfers call “fish.” This custom version bears artwork burned into the wood by a local artist. Mike Lavecchia remembers the magic of his first job, at Burton Snowboards in Vermont. 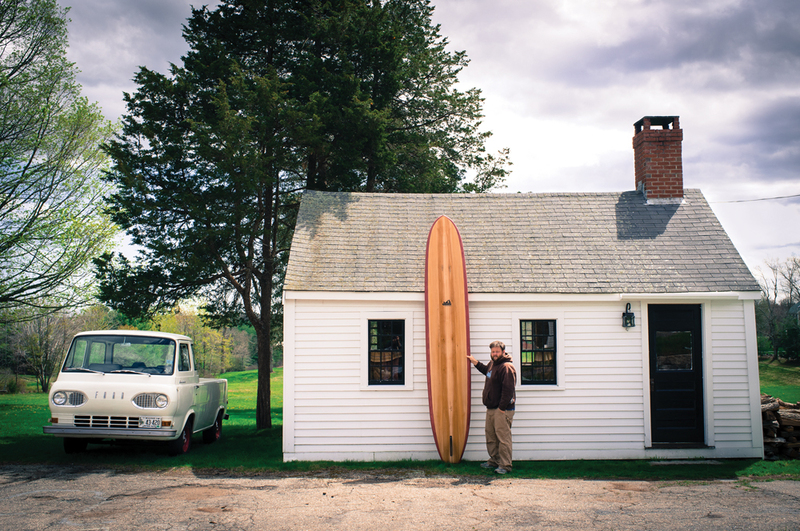 Now LaVecchia, 51, is a wizard of sorts in his own Oz: Grain Surfboards, the company he founded in 2005 in the coastal town of York, Maine. A devoted – some would say rabid – fan base of surfers reveres Grain’s handmade, hollow wooden boards for their beauty and brawn. 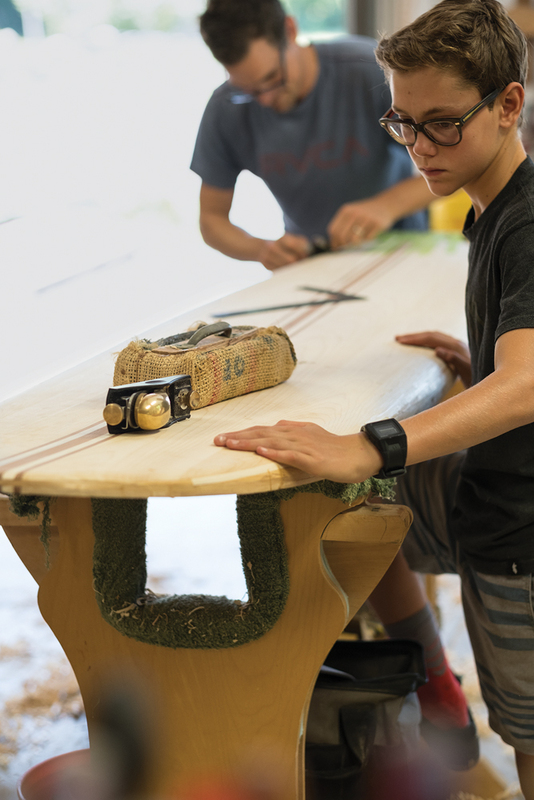 Made from locally harvested northern white cedar planks, sometimes accented with reclaimed Western red cedar strips, the boards offer a more sustainable, less toxic alternative to the foam and fiberglass versions most modern surfers use. And unlike the smoke-and-mirrors wizard in Hollywood’s Oz, LaVecchia operates a wide-open business that offers do-it-yourself kits and board-building workshops. The New Jersey native discovered surfing after feeding two earlier passions – snowboarding and sailing. In the 1990s, living in Burlington, Vermont, he started buying small sailboats; when he’d buy a “new” one, it was often older and in rougher shape than the one before. (“I’ve always loved working on boats as much as using them,” he declares.) He later captained charter sailboats and oversaw construction of an 88-foot replica 1862 wooden schooner at Lake Champlain Maritime Museum. “I realized that the things I loved about boats all narrowed down to wood. I love the history and how they’re built by hand,” says LaVecchia, who lives year-round on a 45-foot wooden trawler docked in Kittery, Maine. After friends introduced him to surfing, LaVecchia carried those same sentiments to surfboards and built his first one in York, where he and his youngest brother, Nick, now 43 and a photographer, had gone “for the summer” to be closer to the waves. They never left. A lineup of most of the models Grain offers. Owner Mike LaVecchia with a board he made for himself. Some of his students used to stay in this historic cabin while attending classes at the York, Maine, shop. A father and son build a board at one of Grain’s growing slate of classes. Grain surfboards, made from locally harvested wood, offer an earth-friendly alternative to typical foam and fiberglass boards. Grain got a big boost early on when a local article about the company was picked up by the Associated Press and ended up running in newspapers around the world. “Within a few days, we had six orders for boards; we’d only made six up until then,” says LaVecchia. Grain added kit sales to expand the business, share design knowledge, introduce surfers to the joy of making, and promote the use of wooden boards. “We talk about being advocates for wooden surfboards and being environmentally friendly, but we also knew our boards were relatively expensive, so we wanted to start selling kits so more people could ride and enjoy wooden boards,” says LaVecchia, who still surfs as much as possible. Grain sells about 50 custom boards a year, which take 40 to 60 hours each to make. Kit sales have fallen as class attendance has climbed. Workshops are held all year at Grain’s Maine base, elsewhere on the East Coast, and now and then on the West Coast. Last year, two alumni opened a Grain outpost on Long Island; they host regular weekend workshops. Full frame: While Mike LaVecchia was building surfboards, his brother, Nick, found his calling photographing them, in and out of the water. His images appear on Grain’s website and social media accounts. Fervent followers: Grain has nearly 52,000 fans on Instagram, some 12,000 on Facebook, and more than 7,000 newsletter subscribers. Gathering of the tribes: Grain’s annual Surf Re-Evolution event features likeminded companies and makers, surfing talks and demos, bands, beer, and a bonfire. Last year’s attendance topped 1,000.